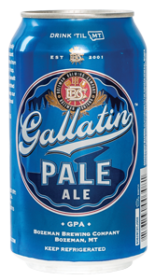 Gallatin Pale is an American beer, it has an alcohol content of 5%. Our GPA finds a symbiotic balance between malt sweetness and hop bitterness providing a moderate toasty body and a crisp, satisfying finish. The malt base contains just a touch of Vienna and Crystal 40 added to our fine Montana grown and malted pale barley. The hop charge starts with early kettle additions of the classic Northern Brewer, which is known as a very neutral and clean bittering hop. The fruity hop flavor and aroma come from heavy late additions of modern favorites Citra, Equinox and Amarillo. As always, a portion of every keg or can sold will go to the Greater Gallatin Watershed Council to help them keep our brewing and recreational waters clean. Cheers!